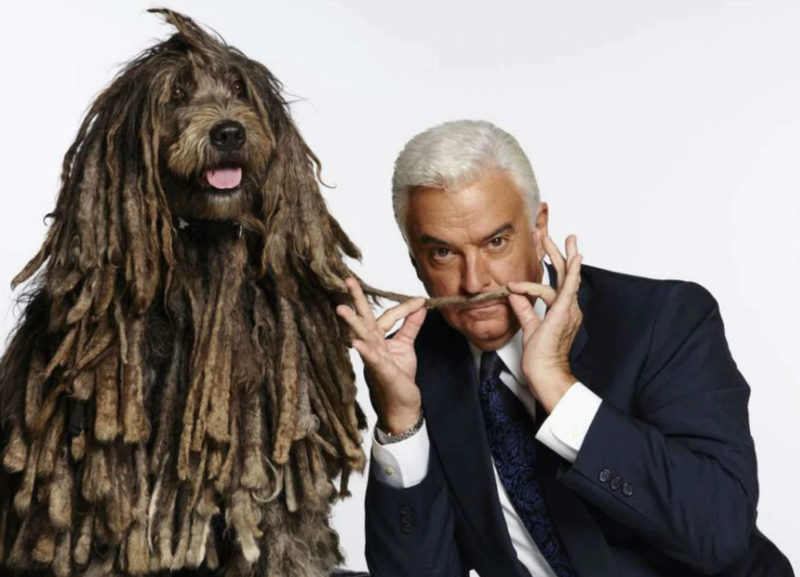 Philly is getting a double shot of John O’Hurley during National Dog Show week. You know O’Hurley. You know his sonorous voice from a bunch of cartoons — including his gig as King Neptune on SpongeBob SquarePants. Among many film and TV credits, he played J. Peterman (Elaine’s boss) in Seinfeld from 1995 to 1998 and hosted Family Feud from 2006 to 2010. He’s a classically trained vocalist who recently finished four months on Broadway as Billy Flynn in Chicago … and he has just been named to succeed Cuba Gooding in the role Nov. 20-Dec. 2. He can also dance a lick. The world will not soon forget that in 2005 O’Hurley and partner Charlotte Jørgensen made the finals of the first Dancing with the Stars and … lost! So great was audience outrage the pair were brought back for a controversial “grudge match” and emerged victorious. O’Hurley is also a crusader for epilepsy awareness and treatment, dating to the death of a sister from complications due to epilepsy. He calls The Perfect Dog “a wonderful expansion of this simple poem I wrote years ago.” It has a wonderful message: None of us is perfect, but there is a perfect dog, the one sitting next to you. Whoa, whoa, slow down. How’d that last leap happen? “It was a bizarre occurrence,” O’Hurley says. “In 2013, I was doing a relaunch of Spamalot at the Municipal Opera Theatre in St. Louis. I’d been in that show in Las Vegas and again in Los Angeles. Eric Idle came out to host the show, and Eric’s team and I sat down and rehashed old times. Previous Post: « Two Cute New Breeds Join the 2018 National Dog Show: See the Pics! from People Magazine!